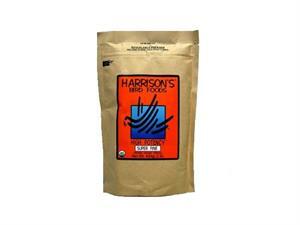 Harrison's High Potency Super Fine is a tasty diet with more protein, fiber and fat than Harrison's Adult Lifetime pellets. Super Fine pellets are recommended for Petite, Tiny and Small birds. High Potency's extra fat and protein are especially helpful during diet conversion, and for molting, overweight, underweight, recently weaned (up to 8 months old), special needs or sick birds. 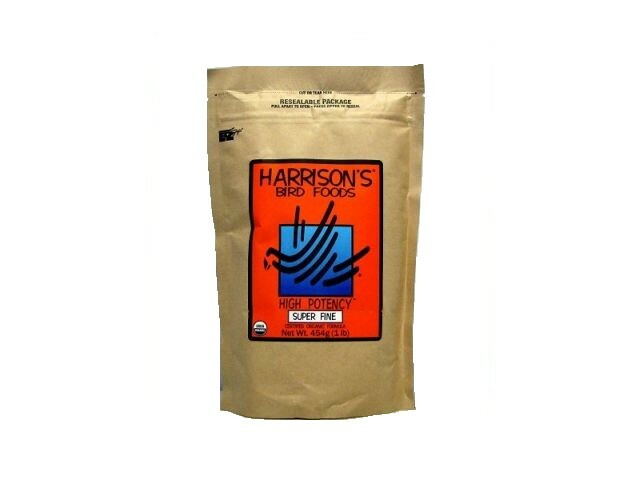 Check out our low prices on all Harrison's bird food. Ingredients: *Hulled Grey Millet, *Ground Hull-less Barley, *Ground Soybeans, *Ground Yellow Corn, *Ground Shelled Peanuts, *Ground Shelled Sunflower Seeds, *Ground Green Peas, *Ground Lentils, *Ground Toasted Oat Groats, *Ground Rice, *Sunflower Oil, *Chia Seed, *Ground Alfalfa, Calcium Carbonate, Montmorillonite Clay, *Ground Dried Sea Kelp, Vitamin E Supplement, Sea Salt, Natural Mixed Tocopherols, Lecithin, Rosemary Extract, *Algae Meal, Vitamin A Supplement, Vitamin D3 Supplement, Dl-Alpha Tocopheryl Acetate, Vitamin B12 Supplement, Riboflavin Supplement, D-Calcium Pantothenate, Niacin Supplement, Pyridoxine Hydrochloride, D-Biotin, Thiamine Mononitrate, Folic Acid, Zinc Sulfate, Manganese Sulfate, Copper Sulfate, Sodium Selenite, Calcium Carbonate, *Vegetable Oil.